November is Osteoporosis Month – so let’s talk bone health, shall we? There’s so much information out there on Calcium and Vitamin D being the hallmarks of bone health, yet most of us don’t actually get enough of either for optimizing our bone health. Not to mention other aspects like resistance exercise, and micronutrients like Potassium, Phosphorous and Magnesium that don’t get nearly enough attention as they should. If this is news to you, you will like to know that there’s a lot of other foods that can support our bone health other than dairy – one of those special foods is prunes. California prunes (AKA dried plums) are high in potassium, and dietary fibre – some recent research shows that eating just 5-6 California prunes (one serving, or 40g) a day helps slow bone loss. 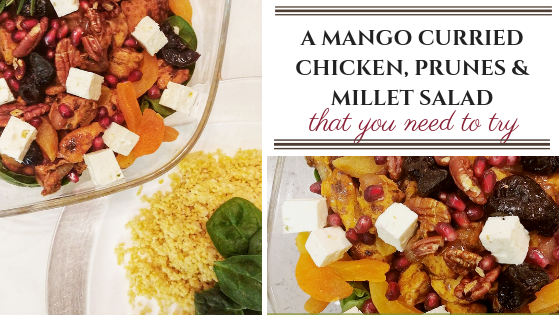 This recipe is inspired by Moroccan flavours, and it can be served warm, or cold – as a salad, or grain bowl. You can also switch up some ingredients, and those variations are provided at the end. Prep dressing: lemon juice (or balsamic), olive oil, salt & pepper. 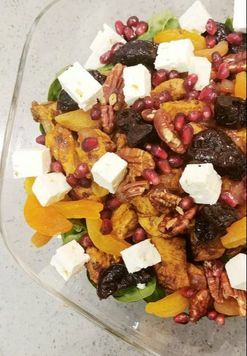 Layer salad: Millet, fresh spinach, cooked chicken mix, prunes, apricots, pomegranate (if using), toasted pecans & feta.